2010 roundup of wild horses in Nevada. (COLORADO)—Friends of Animals (FoA) has filed a lawsuit against the Bureau of Land Management (BLM) and U.S. Secretary of the Interior Sally Jewell to halt further devastating assaults against wild horses in northwest Colorado. 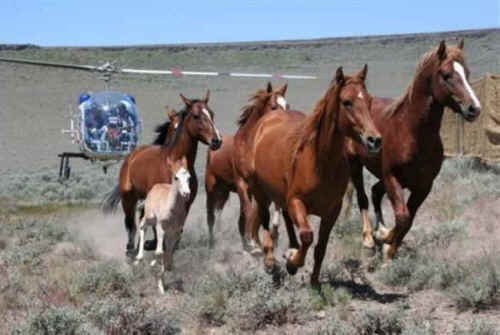 A violent, frightening, inhumane helicopter roundup of up to 167 wild horses from the West Douglas Herd Area and possibly some wild horses from the Piceance-East Douglas Herd Management Area is already underway. And the BLM has once again contracted with Sun J Livestock, which historically has been abusive during its helicopter roundups—running the wild horses past their point of exhaustion, rushing them into the traps and leaving foals behind. BLM’s Decision Record authorizes the continued removal of wild horses from northwest Colorado for several years as part of its extinction plan. FoA’s lawsuit states that BLM’s decision—which authorizes the continued removal of wild horses for several years, including helicopter drive trapping, helicopter assisted roping and bait and water trapping—fails to fulfill the agency’s obligations under the National Environmental Policy Act. BLM does not provide a reasonable discussion of, or adequately disclose, the impacts to targeted wild horses themselves, including the likelihood of short and long-term physical, social and behavioral changes associated with roundups and removals. According to the lawsuit, the intricate physiological events that occur during a wild horses fight or flight reaction to a helicopter round up suggest that these are assaults against wild horses and are not humane as the BLM maintains, thus violating the Wild Horse and Burro Act of 1971. “The Bureau of Land Management has never really publically examined the emotional, physical or social impacts to wild horses subjected to helicopter roundups on federal public lands,” said Michael Harris, director of Friends of Animals’ Wildlife Law Program. “Coloradans should demand they do so before some of our last wild horses are subjected to such devastating physical and emotional pain.